The Rosa Parks bus at the Henry Ford on exhibit, and yes, you can climb aboard and sit in the seat Rosa Parks once sat in..
Jan. 23, 2018 – It’s the most significant artifact of the modern Civil Rights Movement, Christian Overland, executive vice president and chief historian at the Henry Ford in Dearborn, Mich., said to Student News Net last Friday as he stood beside the 1950s era olive green and yellow Montgomery, Alabama city bus 2857 – the Rosa Parks Bus. Visitors to the Henry Ford Museum of American Innovation can board the bus and sit in the exact seat occupied by Rosa Parks on Dec. 1, 1955 when James Blake, the bus driver, ordered her to relinquish her seat to a white passenger. She peacefully and politely refused. As a result, Rosa was arrested on a misdemeanor charge of violating the city’s segregation ordinance, taken to jail, and then released quickly when a friend posted the $100 bail. Montgomery’s African American community harnessed their collective economic power to protest Rosa’s arrest through a peaceful boycott of the Montgomery city bus system. The boycott lasted 381 days. In 1956, the U.S. Supreme Court ruled it was unconstitutional to segregate people, based on race, on public transportation. The Montgomery City bus system could no longer mandate separate sections for white and black passengers. Rosa’s simple action of remaining seated to stand up for her civil rights and the rights of all African Americans propelled her and the Civil Rights Movement to national prominence. Bus 2857 perfectly meets the Henry Ford’s mission of “learning by doing.” While sitting where Rosa sat and in other seats on the bus, visitors listen to her voice speaking to them in a 2-minute recording recalling her action that fateful day. On Dec. 1, 1955, Rosa sat in the middle seat on the aisle. Acquiring and preserving the Rosa Parks Bus is an amazing story. In 2000-2001, Christian and his colleagues learned that a bus that might be the bus Rosa Parks rode on Dec. 1, 1955 was up for sale on eBay for $100,000. Before bidding on it though, they had to prove it was THE bus. Museum historians, forensic experts, and conservators went to work gathering evidence of its years in service, the provenance they needed to justify purchasing the bus. The bus up for sale certainly looked like it was more than 50 years old. In 1971, the bus was removed from the Montgomery fleet, purchased by a private owner, and relegated to being used as a storage shed for tools on a local farm. It was in disrepair but not ruined because it had been spared harsh winters, Christian explained. A breakthrough in their research came when they found a scrapbook of the Montgomery Bus Boycott with newspaper clippings about the long boycott. From this information, they were able to trace the bus number and the chassis number. Bus 2857 was made in 1948 by General Motors (GM) at its Flint, Michigan factory. It first went to Indiana and then to Montgomery. Museum staff connected the bus to James Blake, the bus driver who filed the complaint against Rosa. With solid proof, the Henry Ford was ready to purchase the bus but the eBay sale had ended. When the bus did not sell on eBay, the bus owner put it up for auction on another Internet site. By now, museums across the country were interested in the bus and also gathering evidence to prove its authenticity. When auction day came in 2001, the Henry Ford prevailed and acquired the bus for $427,000. Museum conservators and material scientists at the Henry Ford then went to work restoring the bus to its original appearance. About 85 percent of the bus is original, Christian said. The bus was put on display at the museum as a stand alone artifact. Rosa came to the museum to view the bus, an emotional experience for everyone present, Christian said. Rosa passed away on Oct. 24, 2005. Draped in purple cloth, the bus was moved to the Charles H. Wright Museum of African American History in Detroit where people lined up for hours to honor the Mother of the Civil Rights Movement. Memorial services were also held in Montgomery, Alabama and in Washington DC where her body laid in state at the Capitol Rotunda. In 2006, the museum opened its new exhibit – With Liberty and Justice for All. 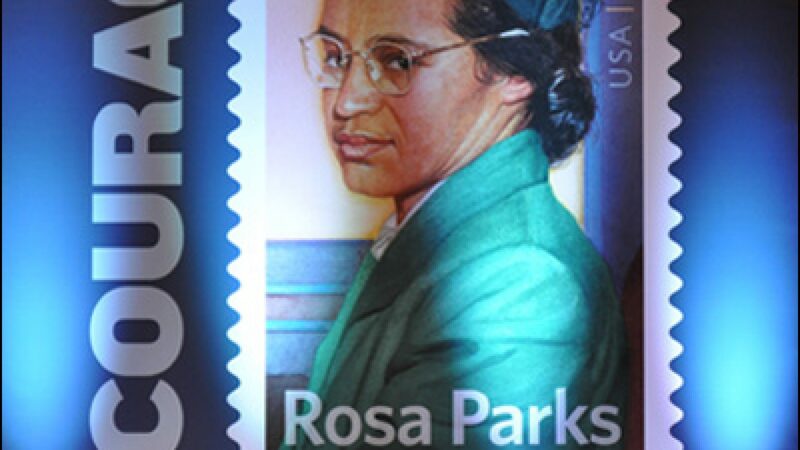 On Feb. 4, 2013, the museum hosted a Day of Courage to honor the 100th anniversary of Rosa’s birth. Dr. Brinkley was a keynote speaker. Gen. George Washington’s folding camp bed, trunk and equipment used during the American Revolution. President Abraham Lincoln sat in this chair in Ford’s Theatre on the night of his assassination – April 14, 1865.